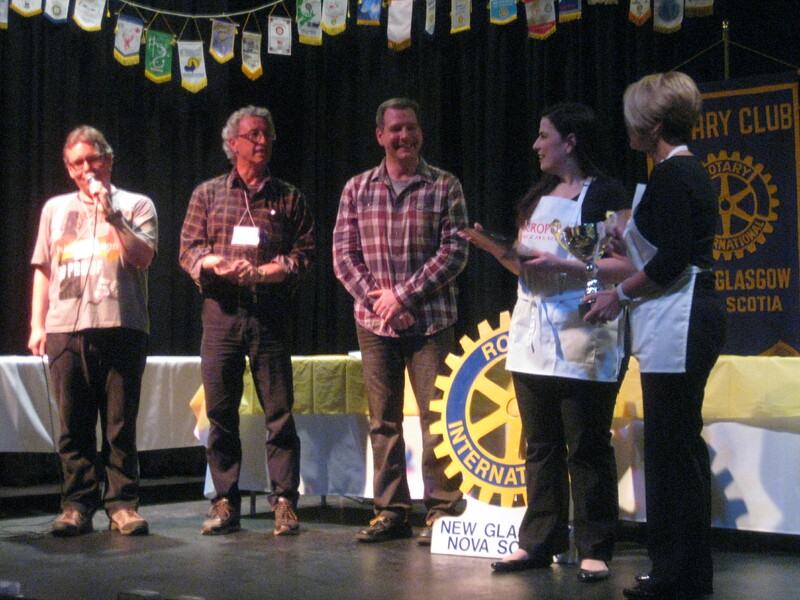 Saturday, April 26 marked the first ever Pictou County Pizza Competition, a Rotary Club fundraiser held in New Glasgow to determine who makes the best Pictou County Pizza. 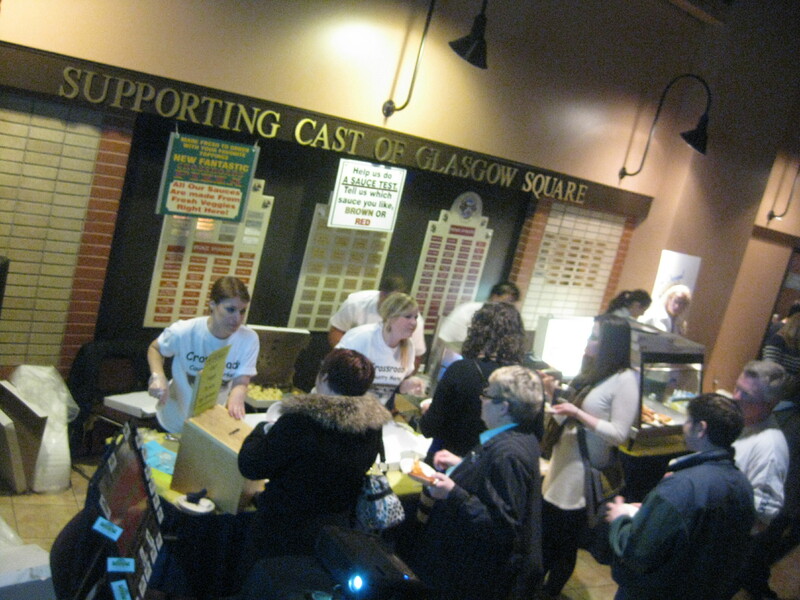 $25 was good for pizza samples from 8 different restaurants and 2 beers from Uncle Leo’s Brewery, as well as the chance to win door prizes, trivia, and a 50/50 draw. What is Pictou County Pizza, you ask? It is a unique regional pizza style native to Pictou County and attributed to a handful of Greek immigrants, though the specifics are controversial. What makes it unique is its brown sauce, which is half top-secret and half chicken-soup-broth-mix, from what I’m told. The locals love it, and visitors swear allegiance to the brown sauce every day! In fact, Pictou County Pizza is in the running for the “Lay’s Do us a Flavour” contest, sitting in 7th place. I had never tried this regional phenomenon, and the Pizza Competition seemed like the perfect opportunity to experience it all at once. So my pal MGyver and I hit the road for a Pictou County Pizza adventure. 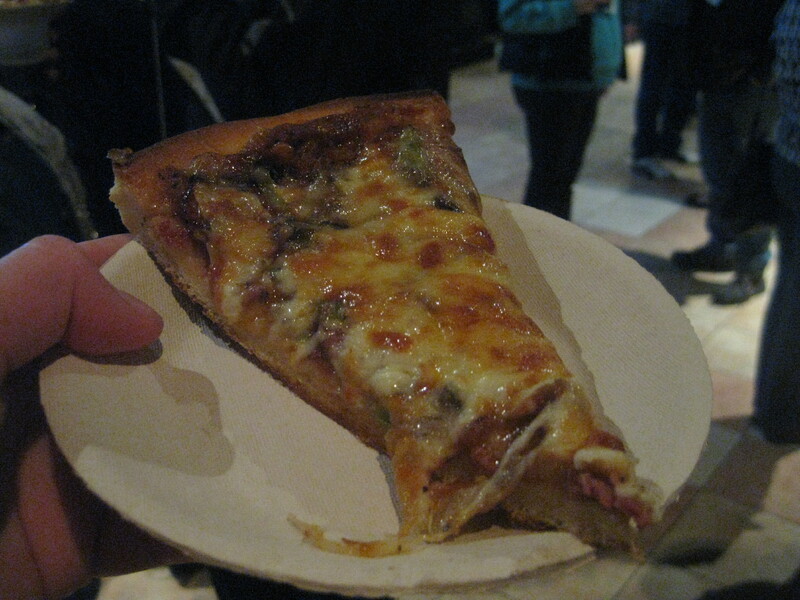 My first taste of brown sauce pizza was at the Acropole booth. I had heard about Acropole a long time back, from a New Glasgow friend living in Calgary at the same time as I. She raved about her “back home” pizza, and how it was often shipped out to the homesick at Fort McMurray. Acropole had been on my bucket list ever since, so I was excited to finally try it! Like in Cape Breton, Pictou County uses “Combination Pizza” to mean pepperoni, green pepper and mushrooms. Where I grew up we called this a “Maritime Classic” and I guess you could say it’s a comfort food – no frills, just the basics. It is a great baseline variety on which to judge pizza. 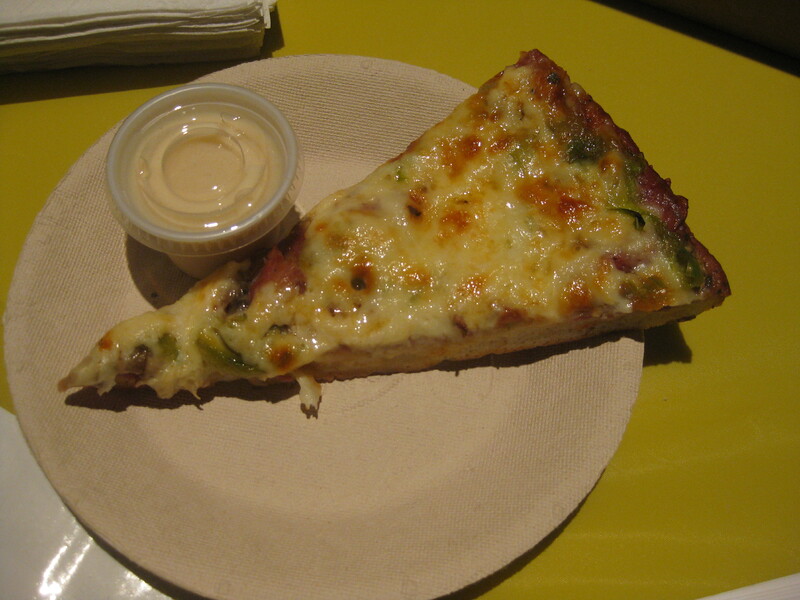 Slice of combination pizza and donair sauce from Acropole. Slice of pepperoni pizza from East Side Pizzeria. I’ve never had anyone recommend East Side Pizzeria to me as their PC pizza of choice, but it is operated by the original owners of Ted’s Pizza which gives it some cred. The crust seemed really fresh and home-made, which is probably due to their claim that it is “old style, stone-baked pizza”. I had a cheesy slice of pepperoni and MGyver, who had decided to play devil’s advocate to my attempts at consistency, had a vegetarian slice he described as “fresh-tasting”. 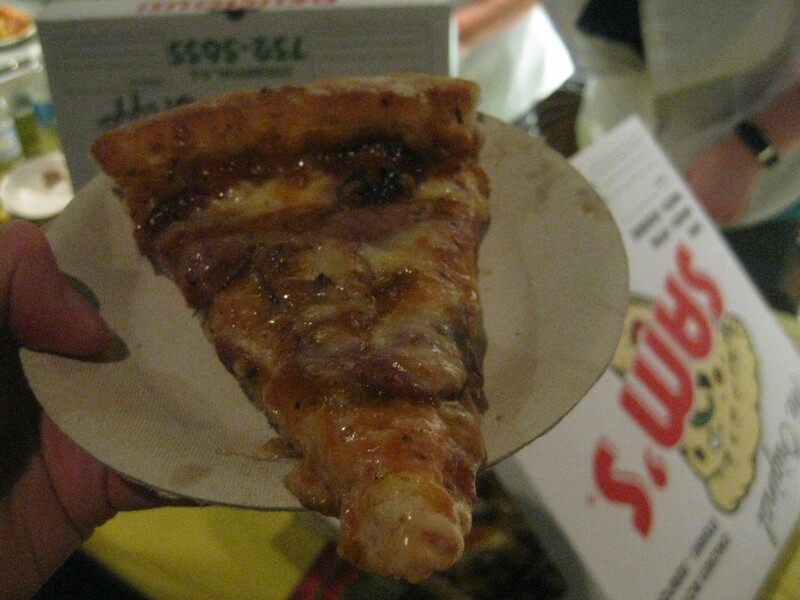 A slice from Sam’s Trenton. Many people have sworn to me that Sam’s Pizza is the best – but location matters. 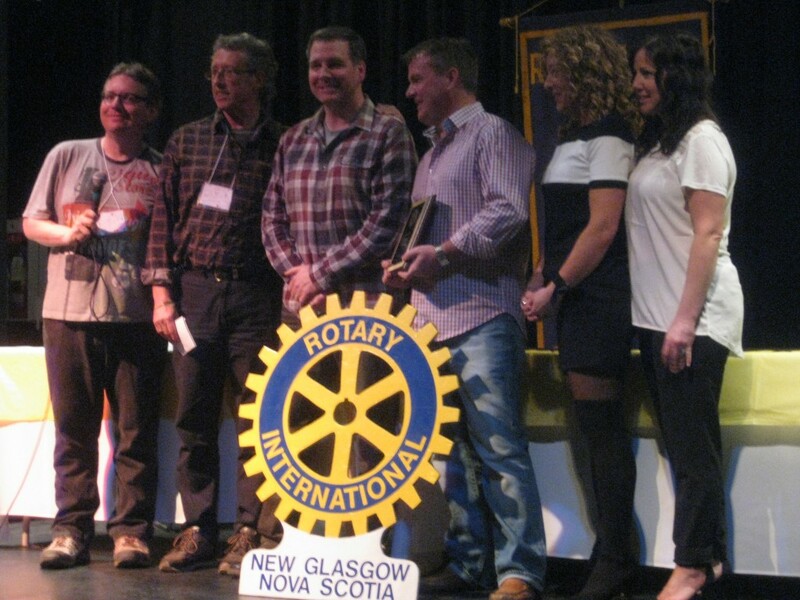 Everyone has their favourite place, and in this case both Sam’s Trenton and Sam’s Stellarton were in attendance. We tried Sam’s Trenton first. This pizza was noticeably more greasy than the previous slices. It almost reminded me of Alexandra’s in Halifax. The brown sauce was also thicker and much more intense. They say brown sauce is spicy, but I found it quite salty. MGyver went renegade, opting for a slice of Greek. The Greek pizza had a thinner crust that complimented the pizza nicely. Ted’s Pizza was serving up fresh slices of the works when we came by. I immediately noticed the fresh bacon squares and rolled-up hamburger balls! Having grown up on Big Red’s Pizza in Lunenburg, I was happy to see this striking resemblance. A friend told me that Acropole uses crumbled bacon on their pizzas and that it’s a deal-breaker for her. I can see that. I myself am quite adverse to the kind of crumbled bacon that is indistinguishable from crumbled sausage and crumbled ham. My first bite of Ted’s was blissful. The cheese was flavourful and plentiful, and the sauce was nice and spicy. This pizza would have been our #1 pick if it wasn’t for the inferior crust. We were also suspicious of the large slices of pepperoni that didn’t resemble the Brothers’ links. 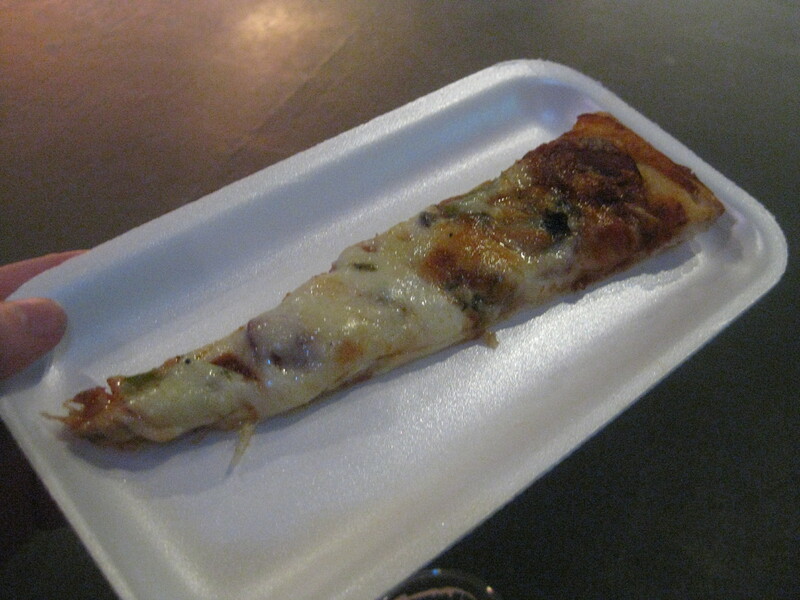 A slice of Tuscan chicken pizza from Café Italia. 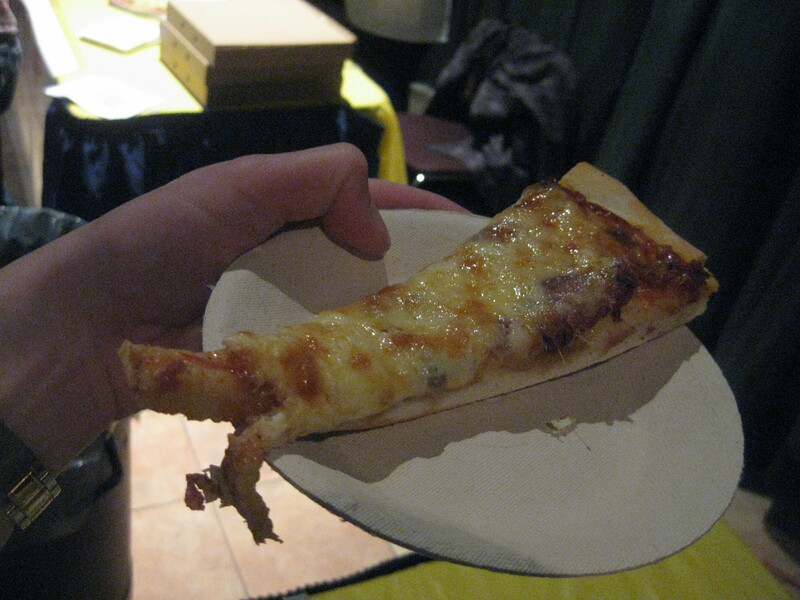 So… not all of the pizzas at the competition were Pictou County style. Sobey’s was there (go figure) with a meatball hero pizza they were testing. Café Italia was serving Italian-ish red sauce pizza. I mean, there was nothing really Italian about the pizza. It was really just ordinary pizza with slightly Italian-sounding toppings. It was okay, but I didn’t finish my slice as I was trying to save room for brown sauce indulgence. A slice from Sam’s in Stellarton. Sam’s Stellarton is the original Sam’s, and some say it’s the best. I ordered a slice of pepperoni and MGyver ordered a veggie. Just like the Trenton Sam’s, it had a very powerful sauce but perhaps a bit more mellow. I think this is my choice of Sams, from my very limited experience. MGyver, on the other hand, was having a bad time. The crust of his pizza was not able to stand up to the watery vegetables. It was a sloppy mess that soaked right into his cardboard plate. 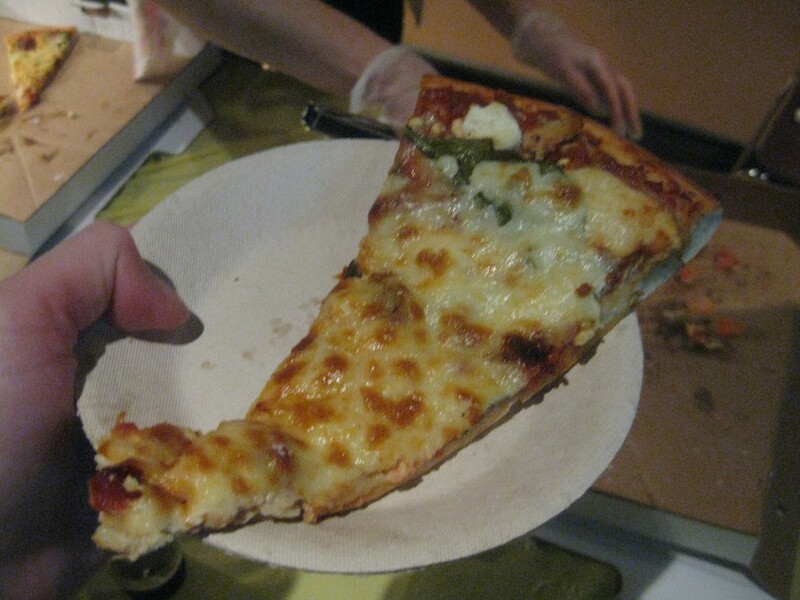 A slice from Crossroads Country Market. convenience items, fresh produce and fishing supplies. And now pizza. They gave everyone samples of red and brown sauce pizza, followed by a full slice of our choosing. Then we were asked to vote for red vs. brown sauce, and make suggestions on how the pizza could be improved before it hits the market. Truth be told, MGyver and I weren’t quite sold on the whole brown sauce thing yet, but brown sauce was the name of the game and why we were there. Once again, he had the veggie and I had the combo. We weren’t pleased with the styrofoam plates, but the pizza was pretty good. We noticed a nice seasoning on the bottom and edges of the crust. This surely has potential! We didn’t have enough bellyroom to try the Sobey’s pizza, but we did take full advantage of the Uncle Leo’s beers included in the ticket price. This was the longest line in the house! We both really enjoyed the Smoked Porter, and fully welcomed the occasional “beer break”, especially after Sam’s Pizza which made me thirsty. Then at 9pm the judges came on stage to do a blind tasting. 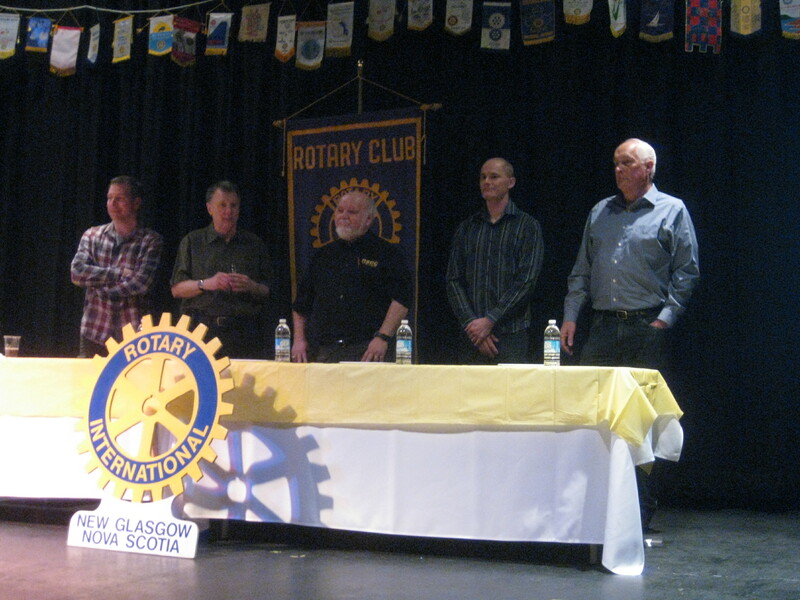 The 5 judges were all local “celebrity” judges, involved in the Rotary Club, NSCC and other community organizations. The winner, as chosen blindly by the judges, was Acropole Pizza! 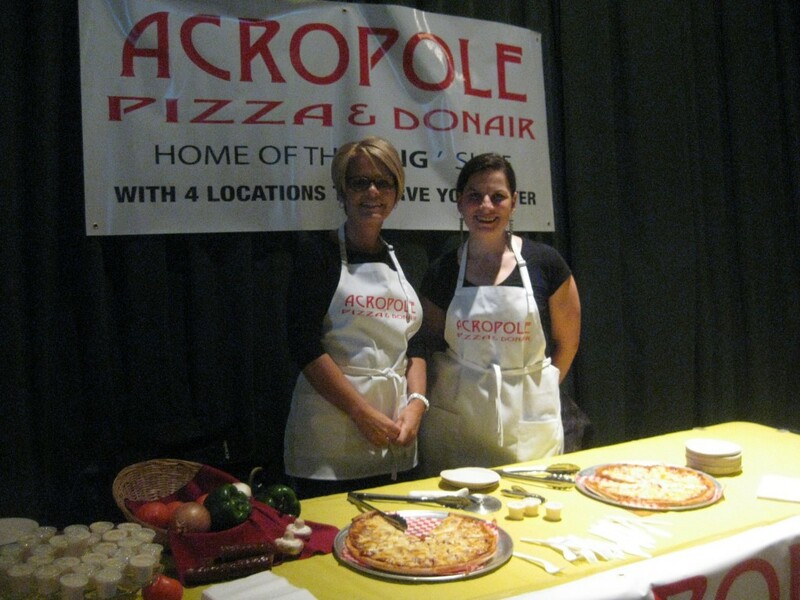 Acropole takes the trophy for Best Pizza in Pictou County! I was actually in such shock that MGyver had to prompt me to take out my camera. Café Italia takes the People’s Choice Award. Okay, so it’s not like the pizza from Café Italia was bad. It just wasn’t anything special. What really shocked me is that a populace that prides itself so much on its brown sauce pizza would pick the untraditional choice. It would be like New Yorkers voting for Chicago Deep Dish! How did this happen? 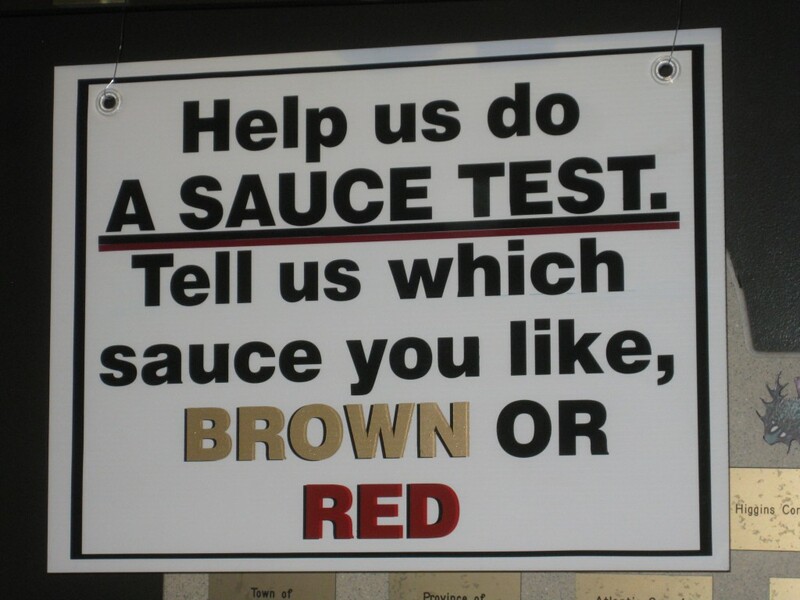 Where is all the brown sauce pride that this contest was geared to promote? Not that I was totally converted. I still love my red sauce. MGyver and I were more impressed by the quality ingredients and chewy crust than we were by the sauce itself. I do think that this pizza is meant to be eaten with donair sauce (and most of our slices were au naturel). The salty-spice of the brown sauce and the sweetness of the donair sauce were made for each other. I think it’s the kind of food that could grow on you. The sauce at Sam’s was too much for my virgin taste buds, but perhaps with a little quality time I will savagely crave it. I’m having a brown sauce craving already…. Therefore, I think another trip to New Glasgow is in order. I hope to see more contests and festivals like this in the future. It creates awareness of regional foods, draws tourism, and fosters community spirit. 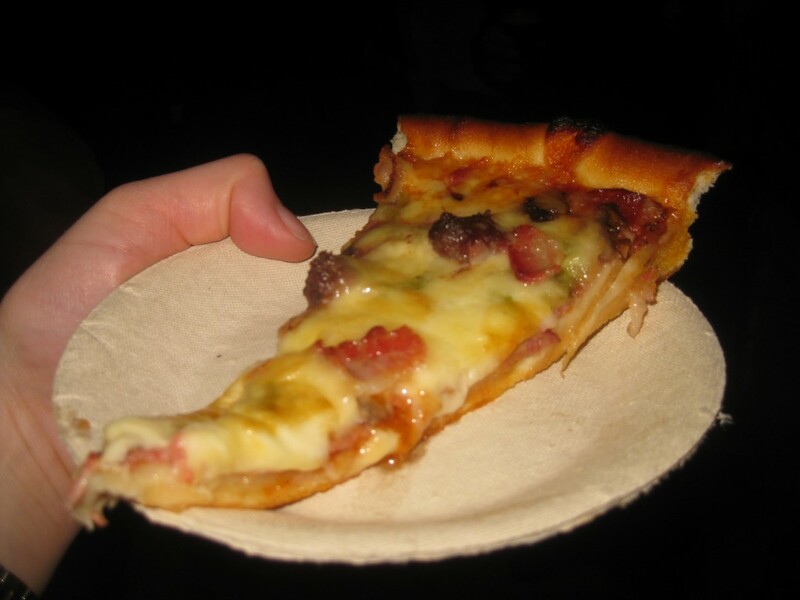 What’s your favourite Pictou County Pizza institution?